The 11th-hour renaming of the playable Taliban fighters as the "Opposing Force" in this month's forthcoming Medal of Honor game is upsetting some gamers who say publisher Electronic Arts isn't standing up for games or free speech. To those gamers, EA said today, try the demo version of the game and see what impact the change has made. "The reason we're posting the multiplayer demo next week is so people can judge for themselves," EA spokesman Jeff Brown told Kotaku. "Does changing one word in the menu screen have any impact on the actual play of the game that takes place in Afghanistan? If they think we shouldn't have done that, I urge them to play it." Medal of Honor, which will be out for the Xbox 360, PlayStation 3 and PC on October 12, is a war game set during the modern conflict in Afghanistan. It's been known for many months that players will control the single-player portion of the game through the eyes of forces allied to the United States. It's also been known that, in multiplayer, gamers were going to be able to choose to control U.S. or Taliban fighters. The inclusion of the Taliban riled some people and caused the game to be blocked from sale on most U.S military bases worldwide. After defending that creative decision for weeks, EA today said it would rename the multiplayer faction. Brown said that the renaming of the Taliban in the multiplayer mode of the forthcoming Medal of Honor game, set for release on October 12, "was made very late in the development cycle and quite recently." The change was made public this morning in an online statement by Medal of Honor's lead producer Greg Goodrich. He cited "feedback from friends and families of fallen soldiers who have expressed concern over the inclusion of the Taliban in the multiplayer portion of our game." While Goodrich said that majority of feedback was "overwhelmingly positive," the studio decided to change the word Taliban from the menu selection screen in multiplayer. He added that "this franchise will never willfully disrespect, intentionally or otherwise, your memory and service." Goodrich said in his statement that the Taliban name change would not affect gameplay. Brown added that it won't affect the look of the game either. "The only thing that has changed is one seven-letter word in the menu screen," Jeff Brown, a spokesperson for Electronic Arts told Kotaku today. "There is not a single pixel or frame that is changed." The Taliban remain part of the enemy fighting force in the game's single-player mode. Earlier this summer, divisions of the U.S. Armed Forces which determine what gets sold on military bases declined to allow Medal of Honor to be sold due to its inclusion of playable Taliban characters. Brown said that decision was not a factor in the renaming change and that retail concerns didn't compel this switch. Despite the minimizing of the Taliban name change, EA's move today nonetheless is a shift from prior statements which had more aggressively defended its range of expression. Only weeks ago, Brown had likened the option to play as the Americans or Taliban in Medal of Honor multiplayer as akin to choosing sides in a childhood game of cops and robbers. Even today he affirms that EA desires the same freedom of expression enjoyed by other forms of entertainment. "If you could place a fiction in Afghanistan in a book or in a movie or in a TV show or other contemporary work , then why draw an artificial distinction of 'but not in a video game?'" he said. He called it "kind of interesting" that the United States Supreme Court will be hearing arguments early next month that will involve that question about whether video games should be given the same speech protections as other forms of entertainment. 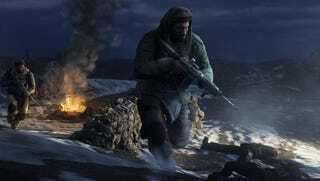 By calling them the "opposing force" in Medal Of Honor, the game's developers now ensure that players will no longer be able to choose to be a Taliban fighter in the game. But, said Brown, "The game takes place in Afghanistan. It's pretty clear who is fighting who." Play the multiplayer demo, he urges, and see for yourself, if the name change is a big deal or not.